The 2010/11 season's disappointment yielded a bright future when Leicester City spent a record breaking £10-15 million on players over the summer. With those big names failing to deliver on their promise of Premier League promotion, many have come under criticism with the future of many now hanging in the balance. As we move on to look ahead to a bright new season, here is Part Two (Part One is here) of our examination of the performance of each and every player to feature in the first team squad over the 2011/12 nPower Championship campaign. Breaking through into a first-team berth under Nigel Pearson was the perfect tonic for St Ledger, who became frustrated having spent a lot of time on the bench under Sven Goran Eriksson. His break into the first team allowed 'Ledge' to sustain his place in the Republic of Ireland squad for Euro 2012, where he wrote his own little piece of Leicester City folklore by becoming the first serving Fox to score in a major international tournament. St Ledger is highly likely to keep his job as a first team defender next term. Injury put paid to the majority of the striker's season and, with Eriksson succeeded by Pearson, his time in the East Midlands has come to an unfortunate end. His City career spanned, remarkably, less than two years but during his short stint at the club he scored six important goals and contributed to many more, often as a wide player. Vassell's pace and skill remains from his international days, but his footballing brain let him down on too many occasions and Pearson has, rightly, allowed Vassell's contract to come to a natural end. Loaned, injured, then on the fringes and now firmly back in the mix, Martyn Waghorn will be praying that next season will be the cure to his annus horribilis that was 2011-12. Waghorn hardly featured for Leicester all term, with Eriksson wanting rid and his injury, sustained in December, saw him out for most of the season despite Pearson's return to the East Midlands. Still only 21, Waghorn will hope he can impress the manager as he did so superbly three years ago, despite the added pressure of having to compete with the likes of David Nugent, Jamie Vardy and Jermaine Beckford for a starting place. Bruno Berner's retirement was well-timed as he bowed gracefully out of professional football to take up coaching roles in his native Switzerland. His few appearances for the Foxes last season exposed his age, the pace and fitness gone but the professional conduct remaining firmly in place. Bruno will be missed by many City fans and his exploits at left-back will be fondly remembered, but he has not departed too soon. A stunning burst into the first team as a 73rd minute substitute on the last day of the season, taking just ten minutes to score his first senior goal and, in doing so, giving Leicester City a valiant win against Leeds United. Panayiotou is unlikely to challenge for a first-team place next term but has proven his competence at this level. A little more first-team football, probably on loan, is a likely next step. For now, however, he can rejoice in an unrivalled 100% record; Games: 1, Goals: 1. Signed in January, Drinkwater has made a steady start to his career at Leicester City but will have to grasp games by the throat next season. He is the first part of Pearson's reinvention of what is becoming an aging team and by signing a young player from a Premier League club, the manager has marked a clear line of intention. Drinkwater has the hunger to take control of a game, the skill to make it his own, but he must do that consistently next season to develop into the type of player City desperately need in their midfield of tomorrow. Successful on-loan, but not with the Foxes. If Danny Drinkwater is the lynchpin of the midfield of tomorrow, then Richie Wellens is that of yesterday. Last season showed that Wellens is now beyond his prime but he still has the talent to lead a team successfully for perhaps one more season. His fitness is key: a fit Wellens is a lethal asset to a Championship side but when out of form he is a liability. Working with Pearson's intense pre-season will help Wellens but his time as first choice midfielder is over: he has to compete in a congested and talented midfield now, and if he fails to accept that challenge his time could well be up. A man signed with much fanfare, Jermaine Beckford's season never really got going. Even a triumphant hat-trick against Forest did not convince the more viciously vocal sections of the Foxes' 'support' that Beckford has the right stuff to lead Leicester City's line and, crucially, it seems it failed to convince Beckford himself. Confidence is key for a striker and despite talking the talk after signing for City, the 28-year-old has failed to walk the walk. Nine goals in 39 league appearances for City hardly betters his poor Everton form, whilst despite claiming the FA Cup golden boot his confidence seems shot. A solid pre-season and rapid start could spur Beckford on, as could the challenge of competing for his place with Jamie Vardy, David Nugent and perhaps Jeffrey Schlupp, but, as we have seen last season, an unhappy Beckford is not somebody that performs to a level needed to spur a side on to winning the league. From City's number one to a free agent in less than twelve months: football is a fickle game. 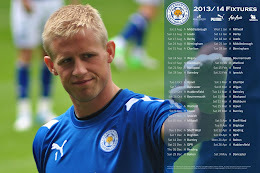 Weale suffered from the ambition shown by the club's Thai owners, whose money lured Kasper Schmeichel to the club. Nobody is to blame for Weale's departure - his time with the Foxes, and in the second tier, has run its course - and he will be much happier, at Yeovil Town, playing for a club close to his family home. Often the brightest part of a mediocre midfield set-up, likeable Japanese Yuki Abe had his reasons for leaving England but did so on a high, following a run of excellent performances early in the season. Arriving in January from Stoke City, Ben Marshall is testament to why having Steve Walsh as chief scout is reason enough to entice Nigel Pearson and his team back to Leicester City. A breath of fresh air, Marshall's dynamism, skill and willingness to have a go endeared him to Foxes supporters, particularly after he burst onto the goalscoring scene with That Goal against Chelsea in the cup. Marshall is certain to play a large part in 2012/13 - here's hoping he can live up to high expectations. An indifferent season saw Neil Danns play extremely well on some occasions and really rather poorly on others. His flashes of anger that saw him dismissed and suspended saw him lose out as he worked hard to get himself into the first team. Injury to Andy King aided Danns in that cause but he is far more likely to feature next term ahead of an ageing Richie Wellens. Let's hope that Danns can step up to the mark and lead the midfield as he did so well on those rare occasions last terms. Featuring in, surprisingly, in four games during a one-month loan from Aston Villa, Nathan Delfouneso was supposed to add brawn to a weary front line whilst David Nugent was injured. As it happened, the young forward failed to score and failed to impress. Surprisingly, whilst others around him have fallen or passed-on, Conrad Logan remains. Once again his Leicester City season was fleeting and he spent much time on loan, but Logan is always there to be called-upon when needed. City's second-choice keeper - and never a true first team man - has signed another contract extension but is once again likely to play second-fiddle and go on loan next term. Compare, last year's notes. An unlikely January signing, Wes Morgan impressed at centre half and will have to again, with two of his defensive colleagues departed and, so far, no others to replace them. It seems City are likely to start the new season as they ended the last, with Morgan partnering Sean St Ledger in defence. Although not an altogether abhorrent idea, neither has particular star quality and both are rather workmanlike, traditional centre halves. Perhaps that's exactly what Pearson is looking for. A loan signing out of left-field, Fernandes impressed many and showed his international worth early-on during his spell with the Foxes but seemed to vanish at some point before Christmas. A regular - and solid - performer under Eriksson, perhaps his ego clashed with the rather more down-to-Earth Nigel Pearson. Either way it was City's loss that the Swiss midfielder disappeared mid-season. Was that the season that made - or the season that broke - Jeffrey Schlupp? His impressive debut saw him score a memorable hat-trick to secure the Foxes an away victory at Rotherham United in the League Cup and he contributed with his first league goal in the 4-0 drubbing of Derby County in October. Schlupp also became the scorer of City's 4,000th league goal when he netted against Birmingham City in March. However, Schlupp has still only scored twice in 21 league appearances and, despite that impressive showing against Rotherham, is yet to convince many that he has what it takes to challenge for a first-team start in a side competing for the Championship title. Sure, Schlupp needs more time - and more first team action - to mature (he is still just 19) and to develop his game. He has the skill, pace and power to make his mark - but can he? Time will tell. As understudy, Kennedy was never going to set the world alight - but then he did. Against Crystal Palace, Pearson opted to shake things up and, with injuries and players suspended, Kennedy saw his loan spell at Peterborough terminated so he could make a first team start for City at Selhurst Park. There will - or should be - more opportunities for this promising full-back next season. The understudy young goalkeeper who did exactly what was asked, when needed. A further youth product to make his initial inroads into the first team, Parkes could be another young gun to fire himself into the limelight next season. A sorry end to a tale of euphoria, injury, frustration and misery. Tunchev ended his 18-month drought to start a handful of games for Leicester but was off-colour and off the pace, despite a loan spell at Selhurst Park. A real shame, then, to see Tunchev - that legend of the League One campaign of 2008/09 - released with barely a whisper. After an impressive performance in pre-season, Liam Moore looked one of the more likely academy players to break through and he has done precisely that. More time and more first-team games will aid his development, but, with Lee Peltier set to depart the King Power Stadium, would Moore cope with being thrust into the limelight? He is certainly gearing-up for the job. Expect more from David Nugent next season as, despite being the club's top scorer, he didn't really fire on all cylinders. At times Nugent lit-up the Championship, as City fans expected that he would, but at others he showed tiredness and weariness alongside an unforgiving strike partner. Nugent has goals in him and plays with a joy that is all too rare amongst footballers today. With Jamie Vardy to partner him up front next season, Nugent is all set to have an absolute ball. Another youth product to make his first team debut last season, Taft has the potential to break properly through the ranks and is certain to taste more first-team action next term. Thanks for finally writing about > "2011/12 Analysed: Player-by-Player - Part Two (Belated)" < Liked it! I am getting experience daily by reading such pleasant posts. That should have much more closer attention and I'll deal with them in different blog site articles: 3D printing, and mobile application. you consider acquiring multi-function printers. that deal advanced features. It's practical if you search for these multifunction printers on amazon, read evaluations and find an affordable multifunction printer for yourself. thank you a lot !! Problem resolve with Samsung ML-1520 on Win8 64bit. Should you be choosing a jewellery making course? It is so enjoyable. You'll like it! say thanks to's terrific suggestion, you are much better than samsung's engineer ! It's really a cool and useful piece of info. I am glad that you just shared this helpful information with us. Please keep us informed like this. Thanks for sharing. I have read so many articles about the blogger lovers but this piece of writing is actually a pleasant paragraph, keep it up. be support ful 2 make pcb effortless. Thankyou.